Other Products by Giant Sports. Search other Amino Acids products. 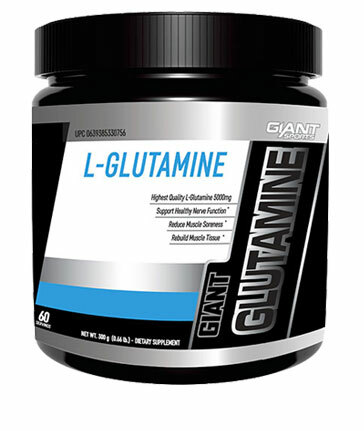 Giant Sports Micronized L-Glutamine powder mixes easily and is tasteless and odourless. It stacks perfectly with Giant Sports Delicious Elite® or 100% Whey, Micronized Creatine and other Giant Sports quality nutrition drinks like Giant RUSH® and Giant BCAA®. Each serving of Giant Sports Glutamine Powder provides 5,000 mg of highest quality L-Glutamine in free form– DON’T SETTLE FOR LESS! Mix 1 serving (5000mg) of Giant Sports L-Glutamine with 235ml water or your favourite beverage and use as directed by your healthcare professional.